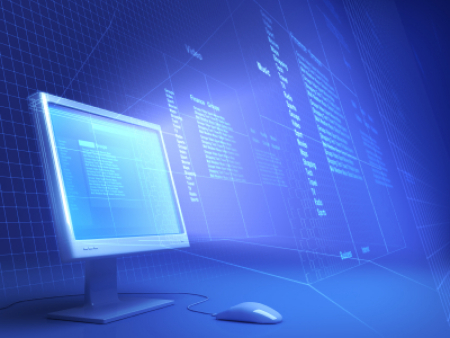 I find it so amazing that information is only a click away these days. If I need a recipe, want to learn how to save seeds from my garden or help my kids with their latest video game, all I have to do is hit up Google and I have an instant answer with videos to show me exactly how to do what I want to do. My computer and iPhone have become my best companion and I carry one or the other to every area of the house I am working in. Gone are the days that I have to go to the library to pick up an outdated book on a subject. Gone are the days that I have to just live without an answer. It really is remarkable that we have so much information at our fingertips. I really don’t know how I ever lived without it. How did any of us every get anything done? But with this great technology does come challenges. Yes, I can find out about anything I want to find out about right now, even at midnight or two in the morning. Yes, it has helped me tremendously. But. . .my challenge is. . .I get so darned distracted! Yes, I get very distracted by the computer. With instant text messaging, Facebook, Twitter, Pintrest,Skype, Google and email, it seems I lose my footing and I lose it often. For instance, I will be looking up how to save the seeds from the tomatoes in my garden and then I get an instant text message asking about that tortilla recipe I have on my blog. It only takes a moment to send the link to my friend right? Wrong, at least for me. While I pull up my blog to email to the link to my friend, I see there are a couple of comments on my new post that I want to check out. So I go to email to send the link and see I have several interesting emails waiting for me. Ok, I’ve sent the link, so I think I’ll just take a peek at some of these emails and weed out the advertisements and such. One of the emails is a post to Pintrest with some good ideas for a wedding shower I’m planning in a few weeks. Need to repin that before I forget. Then I see some other things on Pintrest that I want to repin. Oh, yeah, I noticed when I was in my email program that I had some comments on Facebook as well. I jump over to check those out. Half an hour later, I remember I have some comments I want to check out on my blog. While there, I see there is a draft of a post I forgot to finish last night and pull it up to reread and add a few lines. Then off to see the comments. An hour later, I get up and wonder where I was in the first place. Ah, yes, my tomato is sitting on the counter waiting to be deseeded. For a while I just unplugged and only used email and Google. I didn’t even want to bookmark websites, afraid I would get too distracted. But the pull to Facebook and Pintrest and all the other incredibly wonderful sites just couldn’t be ignored for long. What was I to do? How could I manage my life and still be inspired by all of this wonderful information floating around in cyberspace? Well, unfortunately, I haven’t figured it out completely yet. I know lots of people that can totally manage their lives and still bounce around to all of the incredible tools available on the internet. In my attention deficit mindset though, I guess I’m not one of those people. So I devised a plan that is working for me (somewhat) and I wanted to share it here. First, I decided to figure out what areas of life I was completely passionate about. What things do I like DOING that I want to either learn more about or share with others? For me, this is Gardening, Writing, Cooking, Spirituality, DIY projects and Unschooling. Other categories are great, but these are the ones I get super excited about. I have a beautiful backyard garden and I love to come in and cook with all of the ingredients that I grow. I love to write on my blog and for my writing course, I love everything about spirituality and personal growth, I am learning to make my own cleaners, moisturizers and soaps.I absolutely love my family’s journey with unschooling and learning and sharing about that. So, there. I have identified my passions and have written them down on paper. My next step was to try and limit the activity on the computer to these things. When I see something on Pintrest or Facebook that looks interesting I ask myself (quickly) does this fit into one of my Passion categories or is it something that has the potential of taking time away from the things that I really WANT to be doing? Will following this link, conversation, comment on Facebook, email or whatever contribute to the things I am doing in my life that I am passionate about? If it doesn’t make the cut, I don’t follow it and YES sometimes this is very hard and sometimes I just ignore the question and follow it anyway. One thing I’ve learned in this life is that I LOVE learning new things and that when I stick to the things that really bring me JOY I am much happier and much less distracted. There is no way I could ever DO EVERYTHING in one lifetime (as much as I would love to experience almost everything), so identifying those things that I am good at and that I truly enjoy has been key to navigating the new information age. Truly, I will never stop learning. Truly, I would love to learn it all. But being realistic about it has greatly helped me to stay focused on the things that I love to do and saying no to myself when I’m on Facebook, Pintrest,Skype, Google and email. I guess it’s about setting boundaries. I’ve never been good at this, especially boundaries with myself. But practice makes perfect and boy am I getting a lot of practice. With so much information available with the click of the mouse, I am learning to set those boundaries and I’m all the better for it. It keeps me focused on what I truly love and helps me to be more efficient in my life. I still get distracted, usually daily, but I always forgive myself and then move on to those things that fill my moments with joy and happiness. 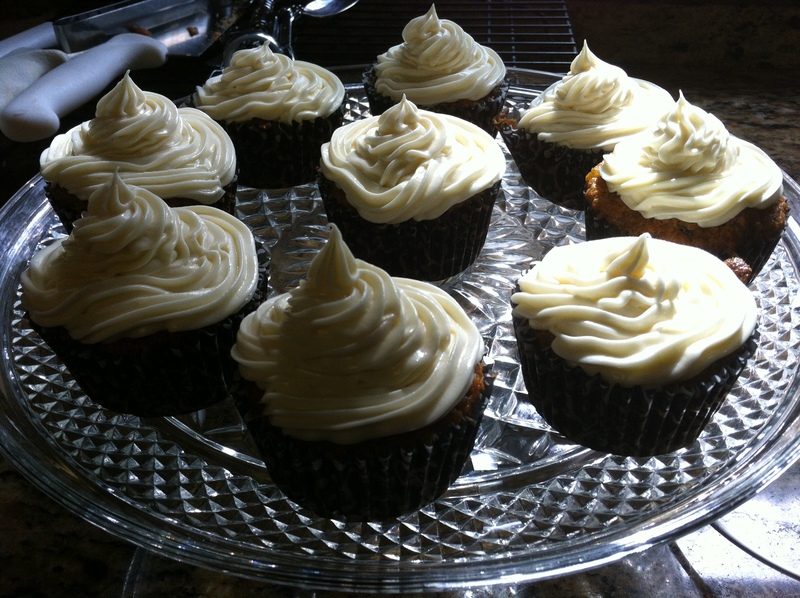 By popular demand I am posting my carrot cake cupcake recipe. After reviewing and practicing with several recipes, I pulled all of the ingredients I loved and came up with my own. My Icing Recipe makes a lot of icing. That’s because I like to pipe the icing on in thick twirly layers. If you don’t like a lot of icing, cut the icing recipe by a third. You can also freeze these well, frosting and all. I’ve frozen them many times and pulled them out for special occasions. They are delish! In a small bowl, combine both flours, baking soda, baking powder, salt, cinnamon, nutmeg and cloves. Set aside. In a large bowl, beat the eggs then add oil, apple sauce, sugars, pineapple and vanilla. Mix the flour mixture into the egg mixture until fully incorporated. Fold in pecans. Batter will be thick. Pour into lined muffin tins. Fill each liner 3/4 full. Store for 3 days in the refrigerator. For longer storage, cover well and place in the freezer for up to a month. Slowly, in 1/2 cup increments add the confectioners’ sugar. Beat until the mixture is smooth and creamy. If icing is too thick, you can add a small amount of milk in increments to desired consistancey. Ice fully cooled cupcakes. For a fancier frosting, put the icing in a pastry bag and pipe with decorating tips (Start at the outside diameter of the cupcake and work your way to the center. You are currently viewing the archives for August, 2012 at Michelle Conaway.